It was the afternoon of November seventh, 76 degrees and humid. Why would anyone go deer hunting? Because its' early November and rutting bucks are taking care of business. I got into my stand about three. I'm sweating, even with perforated shirt and pants. That is poor scent control. The sky was cloudless. It was so bright it was impossible to look west. So I oriented the climber looking east. That's right, they came in behind me and I had to look west. The doe sensed something wasn't right, but she kept looking north, stamping her feet and inching north. The buck stopped on the edge of the CRP, all but his big hind quarters behind an oak bush. I'm standing now, and for around 5 minutes I had to inch my way around, facing her. I still didn't have the bow in my hand. I left it in the holder on the other side! Thankfully, the doe was still sure the danger was to the north. The buck hasn't budged. Over the next several minutes, I managed to get the bow in my left hand. I leaned forward a bit and I noticed that I could see the buck's front leg, and enough of vital zone for a shot. Estimated the range at 40 yards, used that pin and released. The arrow flight looked good; heard a good thwack, but possibly a bit of oak brush thwack too. The buck bounded out in the CRP about 30 yards and looked back for the doe and then bound off out of sight in the field. Was it a good hit? The buck's body language said he was unhurt, he was more interested in where the doe went than in his survival. I decided there was nothing to do but stay in the stand until dark. Keep silent, and come back and look for blood in the morning. About 30 minutes later, ten minutes after sundown, a buck comes limping from the CRP into the same place that the doe had been. Is this the same buck? Did I just knick him in the foreleg? 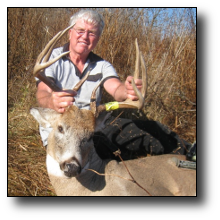 Is he rut crazed enough to come back to where he got hit? I concluded "yes" and released another arrow at him broadside at 40 yards. Another apparent good hit, but he went about ten yards and stopped again, broadside. A third arrow and he only went five yards and dropped. After waiting another half hour, during which three different packs of coyotes howled within a couple hundred yards. I got down and field dress him. There was one complete pass-through, "a bit too far back" as the celebrity hunters call it on the videos. In Mississippi we call it a gut shot. There was another complete pass-through just behind the shoulder, mid-way up. Those were the only injuries I saw at the time. I left him there with my smelly shirt on a small tree nearby, to try to keep the coyotes away, something I had seen in a video. It worked! I returned at dawn and found him untouched. Found my first arrow in the CRP with blood on every vane. But after an hour and a half of searching, found not a drop of blood in the field. Drug him out. Took some pictures, and took him to a meat processor. When they skinned him, there was a small cut on the foreleg, but it didn't look like it could have put that much blood on the fletching. We'r gonna say it did, so I can sleep better. I would guess he was 200 pounds on the hoof. He sure felt like that field dressed trying to pull him up out of the creek bottom. I had to use part of the 100 feet of rope I bring to form a "sling" between two trees on the creek bank so I could plant my boot heels in the sling to get enough traction to pull him up the muddy bank. He grosses 130, with probably more than 5 inches of deducts, but real close to P&Y.